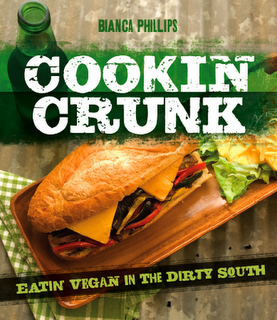 Vegan Crunk: Vegan in 7 Giveaway! I love a simple recipe with few ingredients. I spend so much on groceries every week, mostly because I refuse to deny myself any meal that I want — no matter how many ingredients, no matter how much those cost. That works for me since I don't spend extravagantly in any other area of life. I rarely buy clothes or shoes. I don't travel often (and when I do, it's usually a paid-for work trip). But I realize that saving money would be wise, so I appreciate recipes that call for only a few things. Especially when those things are fresh fruits and veggies. Enter Vegan in 7: Delicious Plant-Based Recipes in 7 Ingredients or Fewer by Rita Serano. I was sent a copy of this to review, but it was mailed to my old office, so when I didn't receive the copy after several weeks, the marketing person for the book then sent me another copy to my our new work address. That copy arrived, and then just a few days later, the other copy was forwarded to my new address too. So I ended up with two copies, and I'll share one with a lucky reader. 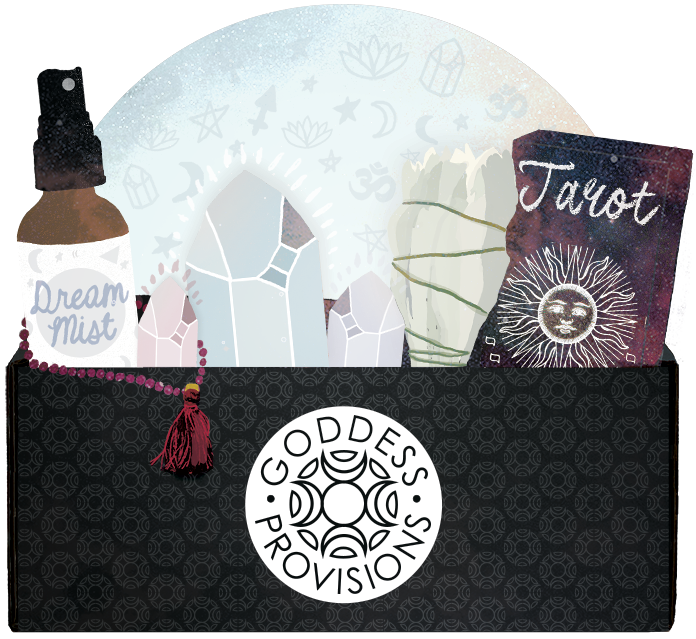 Details for the giveaway at the bottom of this post. Anyway, about the book! As I mentioned, each recipe has seven (or less!) ingredients. And they're primarily fresh, easy to find items. The chapters are organized not by meal type but by adjectives that describe the meals. There's Start (breakfast), Fresh (salads), Fast (easy meals), Nourish (entrees), Gather (made with lots of fresh, seasonal produce), Sweet (desserts), and Basics (sauces, snacks). I started with the Start chapter since I'm all about breakfast. I made the Tofu Scramble and the Blackberry, Plum, & Black Pepper Chia Jam. The scramble was seriously the easiest scram I've ever made, yet it was so full of flavor. It was made with tofu, onion, spinach, turmeric, chili powder, and black salt. That's it! But the onion and black salt made it taste so good! I feel like I always add way too much seasoning and veggies to a scramble. It's nice to have one that's so simple. The jam is an easy stovetop chia jam made with blackberries, plums, lemon, maple, chia seeds, and dash of pepper. I love chia jams because they're such a breeze to make at home. I've been enjoying this on whole wheat toast with vegan butter at breakfast and also on PB&Js for snacks. From the Fast chapter, I made the Portobello Satay with Peanut Sauce. These skewered 'bella mushrooms are grilled (I used my indoor grill) and served with toasted coconut and a tasty peanut sauce. I made these because Paul grew up in Holland, where they eat tons of satay, and portabellas are his favorite veggies. He liked this meal! We served it with steamed kale and quinoa cooked with a little garlic. 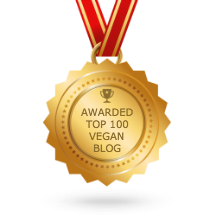 Other meals on my list: Sweet Potato Fries with Spicy Guacamole, Zucchini Frittata, Green Quinoa Bowls (with kale, avocado, quinoa, and peas! ), Noodles with Carrot Miso Sauce, Salt-Baked Beets & Potatoes with Saffron Aioli, Carob Cake with Strawberries and Black Pepper, and Sunflower Butter Fudge. 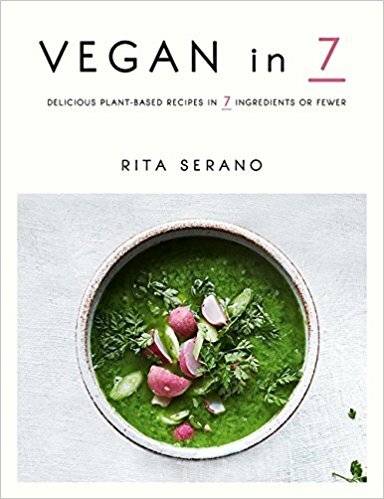 Want your own copy of Vegan in 7? Just leave a comment here with your favorite few-ingredient meal idea. Be sure to leave your email address in the comment so I can contact you if you win! I'll randomly select a winner on Monday night. That's easy...shiitake bacon! 3 ingrediants: shiitakes, olive oil, salt.....and a dash of concentration....watch them close so you don't burn them!!! Mmm I love tofu scramble. My favorite few ingredient meal is a carrot Thai soup. Sometimes my mom will buy a giant bottle of bolthouse farms and never drink it! I take that some peanut butter, olive oil and veggie broth and some veggies like potatoes and whatever I have about to go. So maybe like 10 - 12 ingred. Including onion and garlic. It's very flavorful. My favorite simple meal is drained and rinsed cooked white beans, veggie brotth and trader joe’s frozen cubes of garlic & ginger. After coming to a boil, remove from heat and add lots of kale until wilted then add a scoop of miso paste. So satisfying! Thanks for the giveaway! My favorite is a Vegan Buddha Bowl which can have as many (or few) ingredients as you want. I like Quinoa, Black, Beans, Cucumber, tomatoes and roasted squash -- with an avocado dressing. Roasted Vegetable Quesadillas.Any kind of tortillas,refried beans,roasted veggies.Assemble and grill in a skillet or on the bbq. Our Saturday morning breakfast: pita bread which we heat on the (meat-free) steak pan, tahini sauce (good Nablusian tahini, water, lemon juice, salt and pepper) and fresh tomatoes in the blender with garlic clove, salt and pepper. No forks, a dash of olive oil if needed. Sweet potato + black beans + salsa! I agree with you, one of the things I rarely skimp on is food, especially fresh produce! But one of my favorite few ingredient meals is yellow rice and kale. I just cook the rice according to directions and when it is almost done I throw the kale in with it. Sometimes I use different greens or throw in some white beans or chickpeas. This book sounds amazing! Thanks for hosting the giveaway :) I love simple oatmeals with a few toppings. It is so filling and delicious! If I need very little ingredients I cheat and make spaghetti, jarred tomato sauce, and frozen meatballs from Trader Joes XD Or my favorite tomato and cabbage soup, mostly stock, canned tomatoes, cabbage, onion, and lots of paprika! I think we all know potatoes are my favorite simple meal. Just some potatoes, a little coconut oil and some seasonings! One of my favorite things to make is pasta or zucchini noodles with a sauce made of blended avocado, lemon juice, garlic, olive oil and basil. So good! Butternut squash soup is pretty easy peasy! I've been trying to simplify my eating lately. I'm a big fan of a roasted sweet potato, some beans, and some green veggies. Favorite fash, easy meal..... Clean out the frig bowl! okay, what else would be good?Hey, I have broth. I can have Clean out the frig SOUP!!! My favorite fast, easy meal is black eyed peas, lime juice, cilantro, red onion and some kinda hot pepper. It's great in wraps, lettuce cups, with crackers or just a spoon! A Boca burger cooked in an air fryer with mustard pickle and onion. I am obsessed with almond butter and make simple meals with it all the time. Current favorite: onion bagel, almond butter & smoked tofu. I love quinoa and raisin breakfast cereal- cooked just like oatmeal. Add soy milk and cinnamon and that is it! Those satay skewers look so good! My favorite few-ingredient meal is generally a soup -- white bean and carrot or winter squash is a favorite around here. Thanks for the giveaway opportunity! I'm hampiesandwiches at gmail. As a filling snack or a quick small meal, I like cheezy bean dip (refried beans, vegan cheeze, and hot sauce) with tortilla chips. My favorite quick and easy meal consists of millet, fish, wilted greens, and EVOO! Step 1. 1 1/2 cups buckwheat flour (any kind), 1 1/2 tsp. baking powder, 1/2 tsp. salt. Mix dry ingredients. Step 2. 1 3/4 cup of plant milk (preferably nut milk) or water, 1/4 cup applesauce (unsweetened), 2 tsp. vanilla. Mix wet ingredients. Step 3. Mix wet & dry ingredients together, and add one tbsp. of lemon juice. That’s it for the pancake batter. Griddle away as you would with any standard pancake batter. Step 4. Top your delicious pancakes with jam, syrup, fruit or any nut butter! 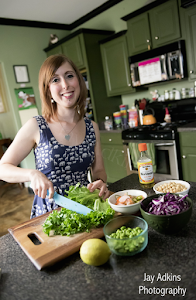 If I should happen to win the book, I would like to donate it to vegan peace who often makes wonderful meals with the little budgeted ingredients she has on hand. To Die for! - So Healthy and Filling! I'm curious to know who won so I can try their creation!